(MIDDLETOWN, CT) October 30, 2018 – As we reach the final week of the 2018 midterm election, an analysis by the Wesleyan Media Project finds that television advertising in federal races is setting new records in volume—and in the volume of negative ads, thanks in part to the large number of competitive races across the country. While the proportion of negative advertising in the post-Labor Day general election period (Sept. 4–Oct. 25) is not actually record-breaking, this election season feels exceptionally negative to many viewers because the sheer number of negative ads on the air is up by 61 percent over the 2014 midterms. 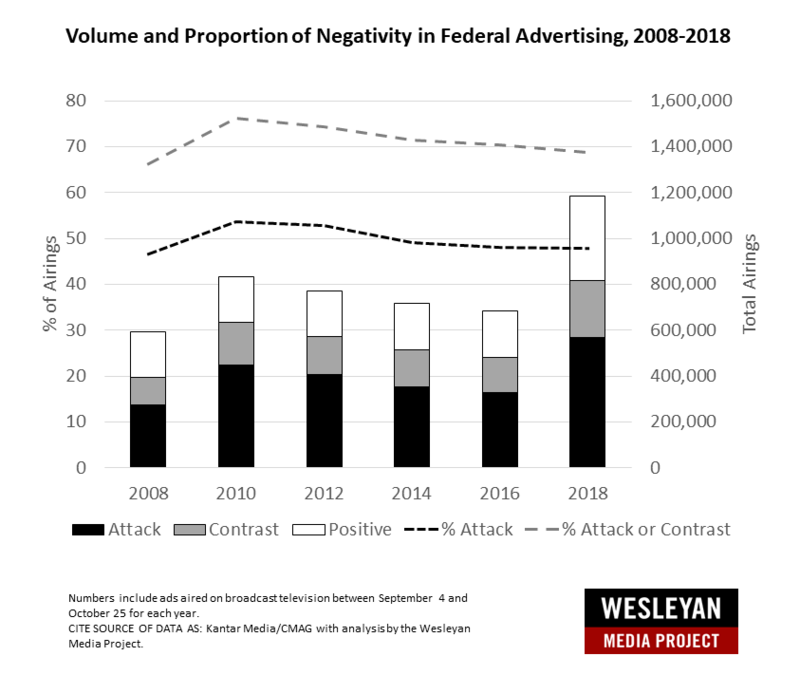 As Figure 1 shows, 54 percent of the ads aired in the 2010 midterm campaign were purely negative, with another 22 percent being contrast ads (that mention both the favored and targeted candidate). Thus, 76 percent of ads featured an attack. In 2018, 48 percent of the ads aired were purely negative, with another 21 percent making contrasts between candidates. Thus, 69 percent of ads contained an attack. 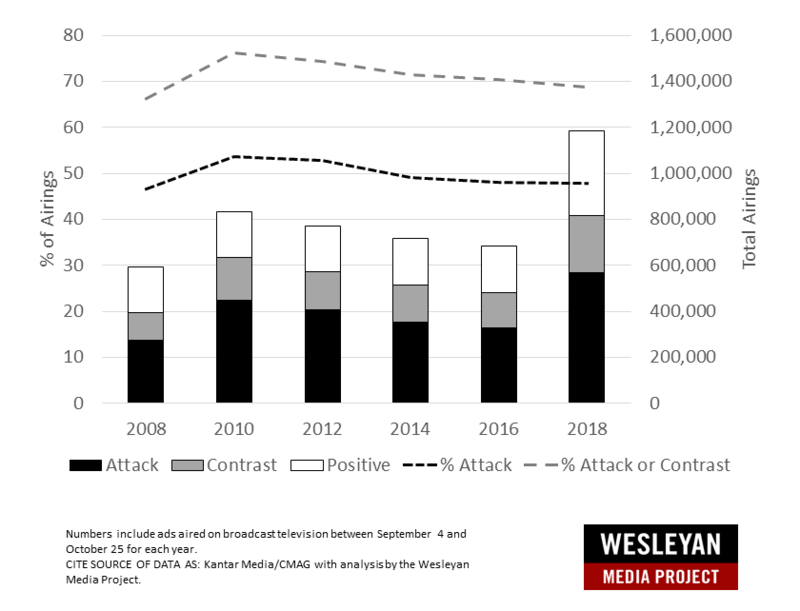 However, no other general election period over the past decade has seen anywhere near the total number of negative (pure attack or attack plus contrast) spots on air. Nearly 569,000 pure attack ads have aired since Labor Day, crushing the 2010 record of nearly 450,000. Table 1 takes a look at cycle-to-date ad totals, since January 1, 2017 (and January 1, 2013, for the previous midterm comparison). Over 3.6 million ads have aired in congressional and gubernatorial campaigns to date, an increase of 59 percent over 2014. This includes a 109 percent increase in House ads and a 66 percent increase in races for governor. The increase in House races is notable because the chamber is considered up for grabs—with most forecasting models giving a strong probability that Democrats take control—while in 2014 the GOP majority was considered much more secure. October 25, 2018 and between January 1, 2013 and October 25, 2014. Figure 2 shows how different parts of the country have been disproportionately hit by this increase in advertising from 2014 to 2018. For instance, the number of federal and gubernatorial ad airings in the Denver media market (the most targeted market in 2014 with just over 50,000 airings that cycle) actually went down (though it has still seen nearly 40,000 airings this cycle), while advertising in many other markets throughout the country increased. Orlando, Florida, has seen 73,197 airings in federal and gubernatorial races so far this cycle with Las Vegas, Nevada, taking a close second at 72,912 airings. The Tampa and Chicago markets have both seen well over 60,000 airings, and another five (Atlanta, Phoenix, Kansas City, Tucson and Miami) all have over 50,000 airings. Indianapolis, which had a mere 6 ads in 2014, has seen nearly 49,000 airings. between January 1, 2017 and October 25, 2018 and between January 1, 2013 and October 25, 2014. Tables 3-5 show the top races for congress and governor in the full cycle period. In both the primary and general election period, the gubernatorial election in Florida has featured nearly 200,000 ad spots, costing over $130 million. Voters in Illinois have seen nearly $100 million in spending for almost 180,000 ad spots. Numbers include ads aired on broadcast television between January 1, 2017 and October 25, 2018. In the battle for the Senate, voters in Florida have seen another 125,000 ads costing almost $100 million. That brings the total in Florida for the two statewide races to nearly one-quarter of a billion dollars. Indiana has featured the most ads for Senate—133,000 airings. Races in Montana and Missouri have each featured over 100,000 airings. Twenty-nine House races have seen at least 10,000 spots on television in the full cycle, including in Montana’s at-large district, where nearly 70,000 ads have aired during the 2017 special election campaign and the 2018 primaries and general election. The table is limited to races with at least 500 airings during the period. In partnership with the Center for Responsive Politics, the Wesleyan Media Project tracks outside group ad spending by the type of donor disclosure. We classify groups as full-disclosure groups (meaning they disclose contributor lists to the Federal Election Commission), non-disclosing dark money groups (which are not required to publicly disclose their donors; these are most often 501c4 non-profits), and partial-disclosure groups (those that disclose donors but also accept contributions from dark money sources). Table 6 outlines the type of disclosure for groups sponsoring ads in congressional races in the full cycle through October 25. Pro-Republican groups have out-advertised pro-Democratic ones in House races—125,000 airings to about 100,000—but the reverse is true in Senate races where pro-Democratic groups have sponsored more ads. Full disclosure groups account for only 8 percent of pro-Democratic ads in Senate races and 23 percent of pro-GOP ads. Nearly four in every ten group ads on air (38.4 percent) come from dark money organizations. There is also more dark money from pro-Democratic groups than from pro-Republican groups. Forty-one percent of group-sponsored ads on behalf of candidates for the U.S. House are from dark money groups, compared to 28 percent for Republican candidates. Forty-three percent of group-sponsored ads for Senate Democrats are from dark money groups, edging out the 39 percent on behalf of Republican candidates. Partial disclosing groups are also very active this cycle, making up another 42.4 percent of federal airings. Over half of the group-sponsored ads for House Republicans are from partial disclosing sources, as are nearly half of the outside group ads backing Senate Democrats. Group classifications from the Center for Responsive Politics. Table 7 shows the top groups advertising in the full cycle in congressional races, along with their group type and disclosure classifications. The partial disclosing Senate Majority PAC—aligned with Democratic candidates—leads the pack with over 80,000 airings in one year of activity. Of all the groups listed in Table 7, only six are full-disclosure groups. Eleven are dark money groups, and seven are partial disclosing groups. As we reported in our last release, Democrats in the period after Labor Day had huge advantages in ads aired in congressional elections. For the period between October 16 and October 25, this advantage has continued, as Table 8 shows. Pro-Democratic ad sponsors have aired over 122,000 ads in House races compared to 73,000 from pro-GOP sponsors. Most of this advantage is because of ads aired by Democratic candidates, who are out-airing their Republican candidate counterparts at a nearly 2:1 ratio. The same is true in Senate races, where Democratic candidates are heavily out-advertising Republican candidates (60,000 to 33,000). The partisan balances in party and group spending are more even, though in most cases Democrats still have aired more ads than Republicans. Table 8 also shows the balance of ads in the 2014 campaign. While Democrats also led in the air war in congressional races that year, the imbalances were less stark. In gubernatorial campaigns, however, Republicans are out-advertising Democrats, and this was similarly true in 2014. Republican Party efforts in these campaigns in 2018 are quite aggressive, while pro-Democratic groups are out-advertising pro-Republican group, helping to offset the imbalance. October 25, 2018 and between October 16, 2014 and October 25, 2014. Tables 9-11 shows the top races for ads aired in congressional and gubernatorial campaigns since October 15. In the top 5 races for governor, pro-GOP sponsors have out-advertised the Democrats. But in congressional races, very few top campaigns feature GOP advantages. In Senate races, for example, the top 16 campaigns (in terms of ads aired) have Democratic ad advantages, including relatively big ones in Florida, Tennessee, and Montana. Numbers include ads aired on broadcast television between October 16 and October 25, 2018. The table is limited to races with at least 1,000 airings during the period. The table is limited to races with at least 1,500 airings during the period. As we reported in our last release, health care is the top focus of 2018, particularly for Democrats, and this continues to be the case as the campaign comes to a close. In the full post-Labor Day period (September 4 through October 25), health care was mentioned in 45 percent of all federal ad airings. This was more than double the second-most-talked-about issue—taxes—that was mentioned in 22 percent of all airings. The third-ranked topic was the budget at a much smaller 14 percent of all airings, followed by Medicare and jobs at 12 percent each. Immigration was mentioned in 9 percent of airings in congressional races (slightly below references to campaign finance and corruption, each at 10 percent). Although references to energy/environment occur in 8 percent of federal airings, explicit discussion of issues like climate change are nearly absent from air (0.4 percent). In gubernatorial races, health care was mentioned in 28 percent of all gubernatorial ad airings, ranking third overall after taxes (34 percent) and education (31 percent). Discussion of jobs took a distant fourth at 18 percent of airings. Public safety (16 percent) and corruption (11 percent) round out the next tier. Democrats are focused on health care in congressional and gubernatorial campaigns alike, with corruption and the budget distant runners-up in Senate race; taxes and social security far back in House races; and education and taxes behind, but still prominent, in gubernatorial campaigns. For Republicans, health care makes the top 5 in statewide and congressional campaigns, but issue priorities are spread out in Senate races, and more heavily focused on taxes in House and gubernatorial races. Numbers include ads aired on broadcast television between September 4 and October 25, 2018.